Discussion in 'Football Forum' started by Lord SInister, Feb 15, 2018. The match opened quietly, with a smaller crowd than usual due to the cold and wet weather, but with Huddersfield apparently the livelier team. Just 17 minutes into the match, Charlton's captain and centre half, Derek Ufton was taken to hospital after he landed awkwardly from a challenge and dislocated his shoulder. With no substitutes allowed, Charlton were forced to play another 73 minutes with ten men. Huddersfield took control of the match. Les Massie pierced the leaky Charlton defence to score the first goal for Huddersfield at 27 minutes. Eight minutes later, Alex Bain added a second. Charlton managed to keep Huddersfield at bay until half-time, and so trailed 2–0 at the break. Seeing little chance of a comeback, some of the crowd started to leave. During half time, Charlton's manager Jimmy Trotter decided to move left winger Johnny Summers to centre forward, and asked his players to feed the ball to Summers, seeing him as their likeliest way to get back into the match. Summers also replaced his old boots, which were on the verge of falling apart, with some new ones. Trotter's plan seemed to be working when the left-footed Summers scored with his unfavoured right foot from close range within 2 minutes of the start of the second half, but the relief was short-lived. The pitch was getting increasingly muddy, and gaps were opening in both teams. But in the space of just 4 minutes, Bain scored a second goal and Bill McGarry put away a penalty, to leave Charlton 4–1 behind. Bob Ledger scored another goal for Huddersfield, giving them a 5–1 lead with less than half an hour of the match left. Charlton seemed lost, a man down and four goals in arrears, and an increasingly large number in the crowd turned towards the exits. But then the match turned. Charlton drew back two goals in the next two minutes, with a Summers pass put into back of the Huddersfield net by Johnny "Buck" Ryan, and then Summers scoring a second goal with his weaker right foot, to leave Charlton two behind, 5–3. Huddersfield could not find a way to stop Charlton's probing attack on the increasingly treacherous pitch. Within 16 minutes of scoring his first goal, Summers completed his hat trick, again with his right foot, and Charlton were only one behind, 5–4. What remained of the home crowd had come alight, cheering their team on, and Summers scored his fourth goal and then his fifth, all right-footed, to give Charlton the lead for the first time in the match, 6–5, with just 9 minutes to play. Charlton had scored five goals in 18 minutes, the last three by Summers within the space of 8 minutes, and Charlton were still ten men against eleven. Huddersfield's manager Bill Shankly was nonplussed. With 4 minutes left, Stan Howard found an equaliser for Huddersfield with a shot that deflected off Charlton defender John Hewie and past Willie Duff into his own goal, 6–6. With barely seconds left, Summers put in a final cross, which Ryan put past the Hudderfield goalkeeper Sandy Kennon. The referee blew his whistle moments after the restart, and Charlton had won a famous victory, 7–6. Ecstatic Charlton supporters invaded the pitch and carried their team from the field cheering. The team came back out into the main stand to accept their supporters' congratulations. Deportivo vs AC Milan (2 legs). CL finals 99 and 2005 definitely top the list. Barcelona-PSG last season and Spurs 3-5 United are up there as well. Palace 3-3 Liverpool was the only good thing in that shite season. That sounds insane. The defenders for both teams need to have long hard looks at themselves though. I've just seen a show entitled Football's Greatest Comebacks. Highlights include Marseilles v Montpellier in 1998-99, which Marseille won 5-4 having been four down, West German Bayer Uerdingen win 7-3 on the night to win 7-5 on aggregate having been 5-1 down against their rivals from the east Dynamo Dresden in a 1985/86 CWC Quarter-Final and Flamengo overcoming Santos in 2011 via a Ronaldinho hattrick to win 5-4 after being 3-0 down (one of which a Puskas Award-winning goal from a young Neymar). THe same year we ended up beating City 4-2 in the cup despite Neville getting sent off for diving and then having some kind of meltdown. Difficult to top being down 3-0 at half time against a fantastic Milan side in the CL final and then go on to win it. Yeah, got to be this. The state of that Milan lineup as well..
Mali v Angola, was 4-0 to Angola 10 minutes before the end. I remember some student put all his savings which was several thousand pounds on Angola winning at 1.01 and lost. It was still 4-1 in 88th minute. Barcelona v PSG too, obviously. Probably even better. On the plus side if Liverpool can win with a team as average as that against a Milan as good as that then there's hope for us yet. We'd sit back with 10 men behind the ball at 3-0 though. Patriots vs Falcons in last year's Super Bowl. Cavs vs Warriors in NBA Finals being down 3-1. Football related and less known: Antwerp vs Vitosha in UEFA Cup '89. 1-3 down after 87' they managed to turn it around and win 4-3. Not a comeback per se, but Spain beating Malta 12-1 to qualify ahead of Holland for the 84 euros was quite the comeback. Also the most obviously bought and paid for result in the history of sports, but meh, water under the bridge. Newcastle 4 - 4 Arsenal from 7 years ago. Arsenal were 4-0 up at one point. Don't think the Gooners have ever recovered from that. Taking the occasion into account, the 1954 World Cup final (Hungary 2 - Germany 3) has to be up there. But David Bowie's The Next Day, obviously. I will never forget the 3-5, was at the pub with ALL my United supporting mates. I was giving it a massive amount of mouth the whole first half and during half time, we had played some lovely stuff. But as soon as Cole put that away after the first minute of the second half I knew we were beaten. I remember Arsenal went 4-0 down to Reading by half time in the League Cup. Went on to win 7-5 after extra time. Gerrard diving for the penalty changed the game. Not the greatest of all, but Chelsea 2-4 Bradford in the FA Cup is worth a mention. Impressive for a League One side to come back from 2-0 down against the Premier League leaders. 1-1 at full time and Germany went 3-1 down in extra time , got it back won the penalty shootout. 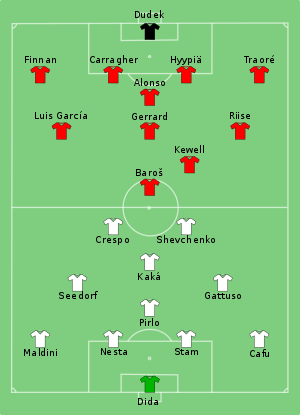 Got to be the second leg of the CL semi final against Juventus in 99. 2 nil down after 11 minutes, it looked all over for us until Captain Keano got us back in the game, and forced us on to the win and on to the final, getting himself booked and banned for the final in the process. The definition of sacraficing yourself for the team and why he is a legend. One of the greatest comebacks and I would say the most important comeback in our modern history. MLS Cup 2003 Conference Semis. San Jose 5-4 LA Galaxy. San Jose lost 2-0 in the away (1st) leg and went 2-0 down early in the 2nd (home) leg. Won the tie 5-4 after extra time. No away goals rule was used at the time.